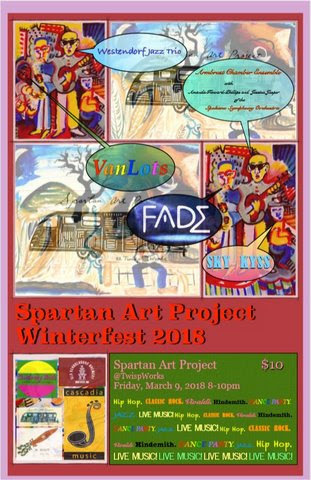 Each year the creative genius’ that make up the Spartan Art Project turn the TwispWorks campus into THE winter venue for live music, art and culture and 2018 is no exception! Join the Spartan for Winterfest 2018 featuring live music from the Westendorf Jazz Trio, the Armbrust Chamber Ensemble, featuring Amanda Howard Phillips and Jessica Jasper of the Spokane Sympathy Orchestra, the world stage premiere of Van Lots, local rock favorites Sky Kyss and Fade! Winterfest is your chance to bust out of the cabin, shake off those late-winter blues and head on down to the TwispWorks campus for an evening of live music, good company and art culminating in the now legendary Winterfest Dance Party! Special thanks to the evenings sponsors the Old Schoolhouse Brewery, KTRT – The Root 97.5, Cascadia Music, Sunberry Buds and of course, The Spartan Art Project! DATE: Fri, Mar 9, 8-10pm. LOCATION: TwispWorks. TICKETS: At the Door, $10. This event is 21+ please.